Early January is cold and snow lays heavy on the ground. The winter landscape often seems silent, still and cold. But, when closely observed, there is much vibrancy, movement and subtlety. As it was on this particular morning. The scene is a familiar area in North Bennington, Vermont. 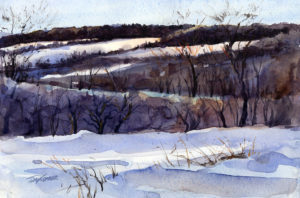 I paint here often – two other paintings in the current winter series are from the same area – “The Beginning” and “A Little Before Sunrise”. For this painting of a winter morning, I really wanted to catch the subtle warm light on the higher hills and contrast the warm pink light with the over all cool blues, violets and grays from elsewhere in the scene. It was also important to keep the scene fluid and active by capturing the slope of the ridgelines and rolling hills as they zig zag toward us and the lower field in the foreground.